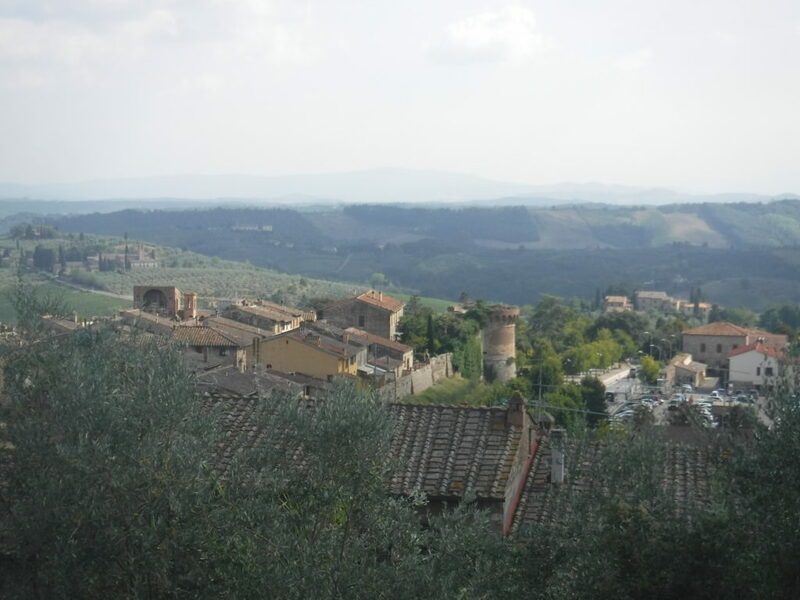 Since I stayed longer in Florence, I’ll talk about the Tuscan countryside first. I joined a tour with my coworker, Alycia, since we were both going to be in Florence at the same time. She had already booked the tickets with her husband and another couple, but said I was welcome to come along, and I’m glad that I did. Tuscany was easily one of the highlights of the trip. All in all, we spent twelve hours on the tour including travel time by bus, but it was time incredibly well-spent. 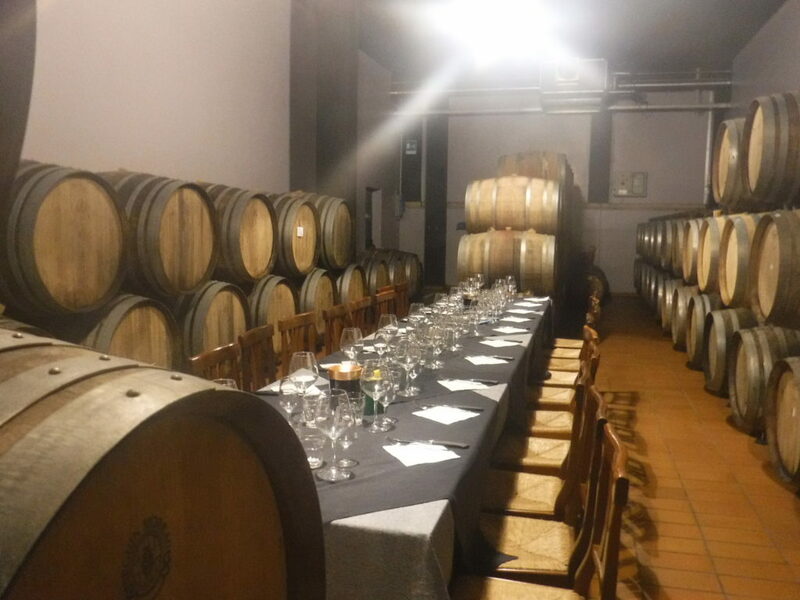 The itinerary included four stops: the castle-village of Monteriggioni, the rival city of the Florentines known as Siena, the amazingly well-preserved medieval town of San Gimignano, and a wine tasting at the Palagetto vineyard. 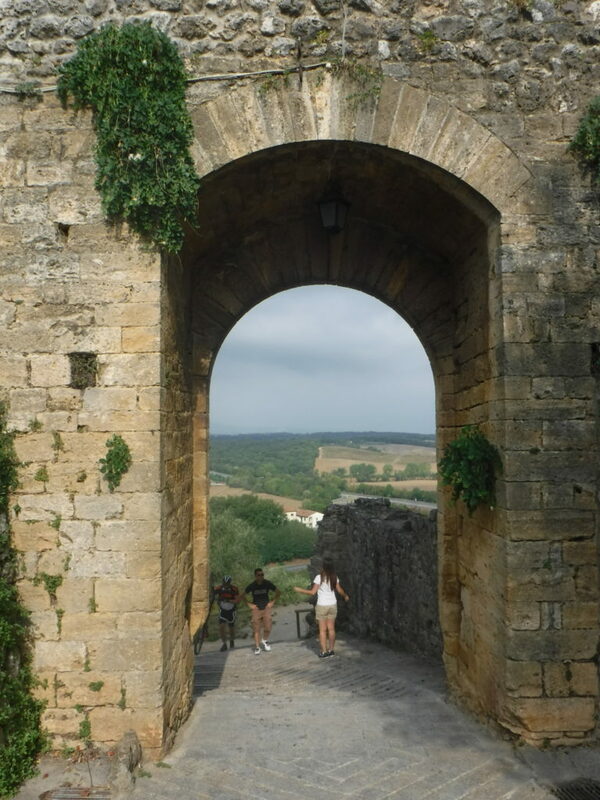 Our first stop, Monteriggioni, was an adorable little village set within the walls of a well-preserved castle fortification. 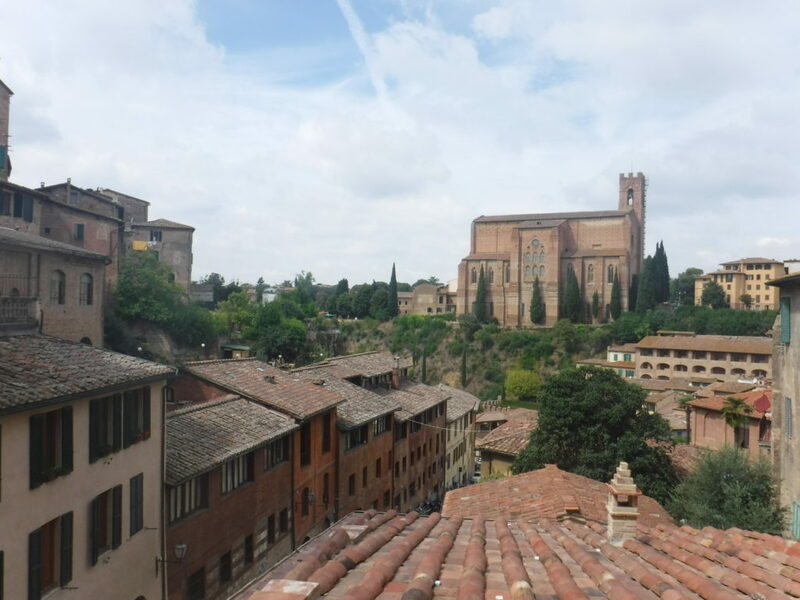 Here I discovered authentic artisan shops, not the kitschy tourist stuff you find in the big cities, and some amazing views of the countryside (though every stop had that, to be honest — all the cities are nestled nicely in the hills of Tuscany). I splurged on a nice bottle of wine for Aimee, purchased from an 800-year-old cellar. This signature vintage has a limited bottling of 6000 per year. Hopefully she lets me have a glass! 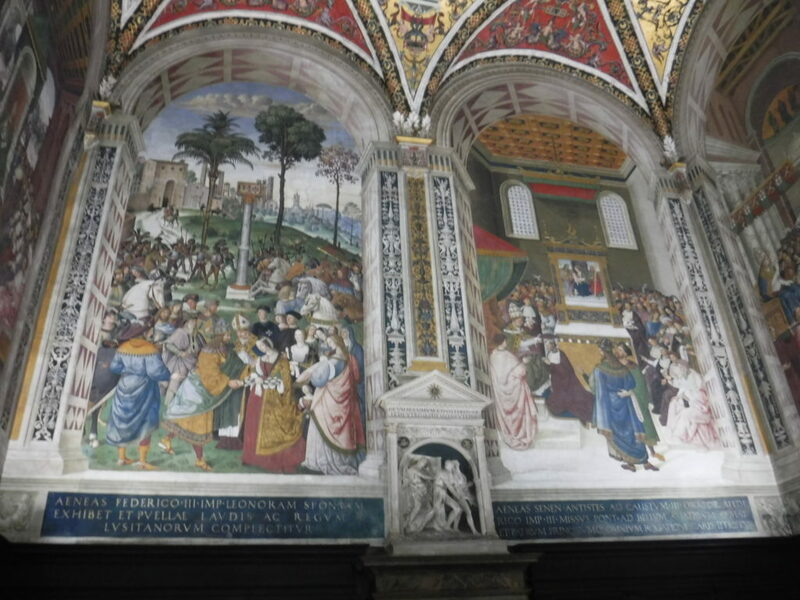 Siena included a historical walking tour. The city is well-known for its annual horse race in the main square to celebrate the Madonna saving them from the plague in the 15th century. More impressive, however, was the church, which took over five hundred years to construct and was intended to be the most impressive cathedral in the entire world. The craftsmanship was exquisite, and I can easily say that it was the most awe-inspiring place of worship that I have seen yet on my tour. 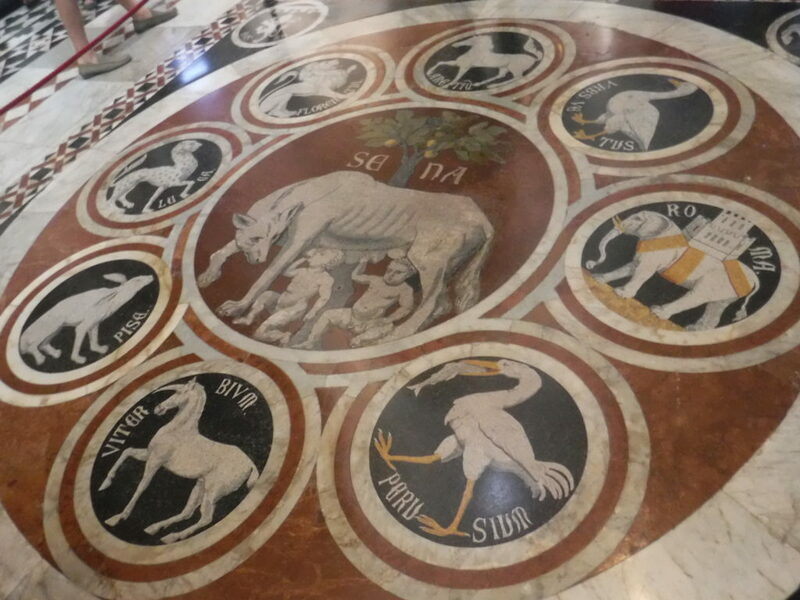 From the stained-glass windows to the paintings by renaissance masters to the engraved floors, everything was breathtaking. 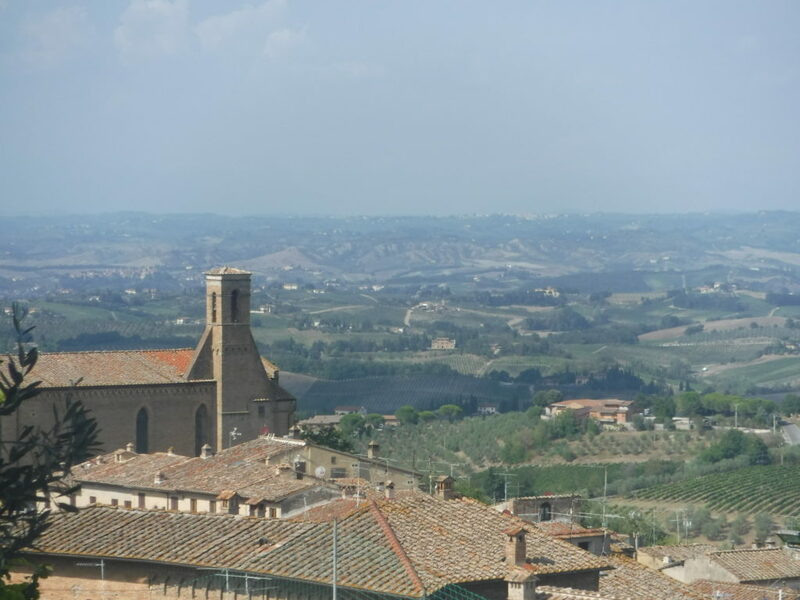 We stopped in Siena for a large and cheap lunch before taking the bus to San Gimignano, another fortress-city in the Tuscan hills. This town was packed with people, but we were treated to more incredible views and a free gelato from a famous local spot. There are lots of handmade crafts and if you deviate from the main street you can find some quiet places to take great photos. San Gimignano had some cool museums which I didn’t have time for, so I’ve bookmarked the town as a place to return to and delve into some local history. Our final stop was the wine tasting, and although I was only planning on buying one bottle, a full tasting convinced me to buy two. The Palagetto vineyard is known for is Vernaccia di San Gimignano grape, as well as its excellent (and ridiculously affordable) Chiantis. From my brief taste of the region, I think you could spend a month in Tuscany and still want more. More wine, more mind-blowing food, more unique artisan shops, more medieval flavour, more panoramic views, more gelato. Venice is magical, Rome is inspirational, and the Cinque Terre is beautiful, but Tuscany felt like the heart of Italy to me.